October 14th, 2015, on a friend’s Plex account. It was made last year, which means it is likely ranked because of hype. I was pretty sure this would be a major disappointment, but I sincerely sought to watch the whole thing objectively. 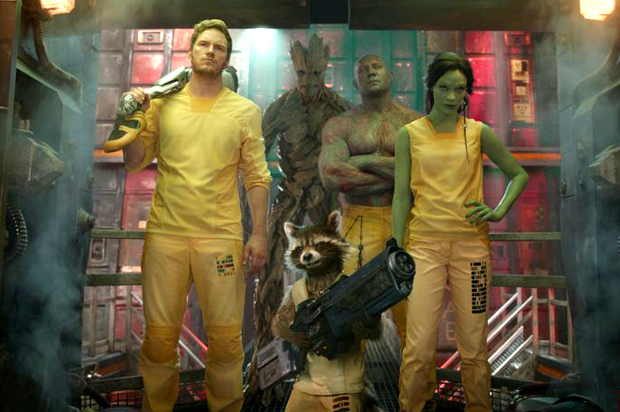 I vaguely remember knowing about the Guardians of the Galaxy as a kid, but the memories are long gone now. You enjoy being talked down to for two hours. You’re a 14 year old boy or younger. You’ll be so enamored by the special effects that you forget how weak the story line is. The visuals and sound are stunning; you’re thrust into another world and kind of forget none of it is real. This, however, is where it ends; we’re forced to endure several corny one-liners, poor acting, and vain attempts at getting us to know the characters for an inevitable series of movies, which hopefully will reveal a third dimension to these very flat personas. To make a brief comparison, I recall watching a film called Bowfinger several years ago. The title character (Steve Martin) is attempting at making a hit action film, but covets quality actors. He manages to get a big action star’s brother, but still wants the real deal, and ends up kidnapping the guy (Eddie Murphy). What the director envisions at the end is, amidst a horrible plot, the star standing on top of a building and shouting “Gotcha suckas!” at some aliens, which is intentionally and painfully awkward. They even did that slow motion down the hallway group shot thing. Loyalty, action, and how to write a comic book script. It did nothing for me personally, except remind me why I don’t go to the theater anymore. Why is this ranked #210? All hype and visual effects. It’s a superhero film, and everyone is in love with this right now. Please make it stop. Offer me food, and perhaps I’d endure it again. Again, all my friends have seen it and probably like it. I’m just a movie hipster now.